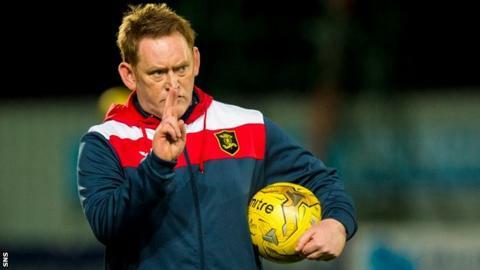 David Hopkin will remain in charge of Livingston for the rest of the season after being appointed as head coach. The former Scotland international, 45, had been in caretaker charge for three games after Mark Burchill was sacked. Livi are currently in the relegation play-off spot in the Scottish Championship. "David understands how important it is for the club and our supporters to retain our Championship status," Livingston said on their website. The club added Hopkin recognised the need to "work within existing budgets to ensure the ongoing financial stability of the football club". Hopkin, who has won one of his three games in charge at Livi, played as a midfielder with several English clubs but started and finished his career at Greenock Morton, where he also went into coaching. He was capped seven times and scored two international goals. "David's intimate knowledge of the existing playing squad, awareness of the ongoing need to develop the pipeline of youth talent, combined with his desire to succeed, were all viewed as key factors in appointing him to the role," Livingston explained in their statement.